Congratulations to the 10 Business and Entrepreneurship graduates from Bondeko hub, Uganda. 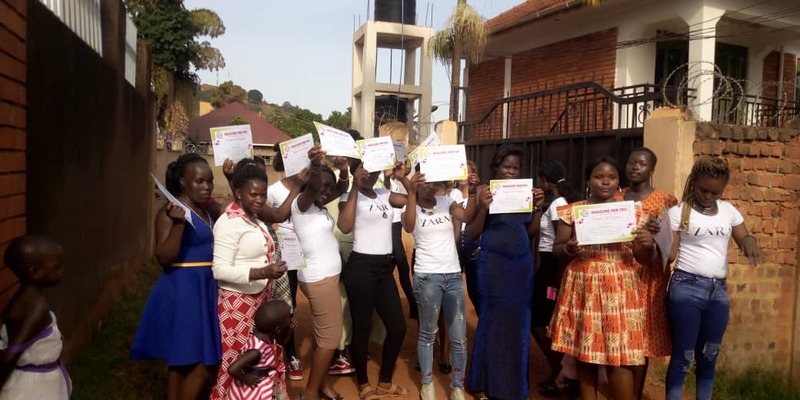 This March, 10 women from the Bondeko hub in Uganda graduated from a Business and Entrepreneurship course run by Xavier Project in partnership with ImagineHer and PED. The course, that focused on how to start and sustain a business, covered a diverse range of topics including how to write a business plan, how to pitch a business model, marketing and sales skills and social media marketing. The programme was an intensive five-month course of learning practical skills that we hope will be of real benefit to the girls as they enter the world of business. Following their graduation, ImagineHer supplied each of the 10 girls with a soft loan of 500,000 UGX enabling them to begin to implement their business plans. These business ideas include opening a day care centre, fabric design, designing an app to teach English to refugees and opening a takeaway restaurant. Graduate Victorine Salamu plans to start a salon and said “The start-up capital of 500,000 plus my little savings will give the needed kick start to start my beauty parlour”. The girls plan to stay in touch and support each other as they start their new businesses. They have already formed a savings group which meets every Saturday to discuss their progress and contribute money towards towards each others initiatives. Xavier Project plans to continue to support these girls and build their capacity in various aspects such as market place literacy, group dynamics and financial management, monitoring and evaluation. This programme is part of Xavier Project’s Community Enterprise Cycle (CEC) model of empowering refugees with practical skills which will generate income. Another graduate, Dorcas Marongo also praised the training. She shared that “This was most hands-on training I have attended since I came to Uganda as a refugee 8 years ago. Thanks Xavier Project and PED, I can confidently say, I will utilise the skills to the best of my ability”. Testimonials such as this one from Dorcas make us confident that this course will enable its graduates to build sustainable businesses which will benefit their communities. Xavier Project would like to wish all the girls the best of luck with each of their new businesses.